Democratic National Committee to Trans People: Drop Dead! Is Cosmopolitan UK Going to Remove This Example of Group Libel Now That The Source Admits It Is False? Looks like 2002 may actually have been. But what’s twelve years between (still unequal under the law) friends, eh? what was always intended to be the ‘next item on the agenda,’ even before the ink on SONDA was dry. Perhaps What Used to be the Advocate’s Treatment of the EEOC Nomination Was a Signal from Gay, Inc.
A number of LGBT groups have come out in support of nominees for a federal agency charged with enforcing civil rights law amid opposition from Republicans and discontent from an anti-gay group. Both nominees were nominated by President Obama to serve on the U.S. Equal Employment Opportunity Commission. P. David Lopez was named in July to serve for another term as the agency’s general counsel and Charlotte Burrows, a former staffer for the late Sen. Edward Kennedy, was named in September to serve as commissioner for the agency. The nation’s largest LGBT group, the Human Rights Campaign, remains silent on the [Lopez] nomination. The organization didn’t respond to multiple requests from the Washington Blade to comment on the nominees, nor to say whether it will include the confirmation votes as part of its congressional scorecard. HRC is what HRC always was and HRC always was what HRC will always be. That sound you hear is high-level negotiations between HRC and the as-yet-undeclared Rand Paul campaign for a ‘see how nonpartisan we are’ 2016 presidential endorsement. Did You Hear the One About the Trans Woman Who Walked Into the Website of What Used to be the Advocate? Well, upon first coming to the item’s URL, one must endure an annoyance advertising video. It could have been – but when I visited the page, I was hit with an ad for Orbitz. The good news is that it wasn’t one of the ones with the obnoxious British woman with the gleaming teeth. Who says David Goodstein is dead? I wonder how many people involved with converting Transgender Day of Remembrance – remembrance of murdered trans people – into LGBT Day of Remembrance for Victims of Bullying and Harassment at some point opposed trans inclusion in ENDA? 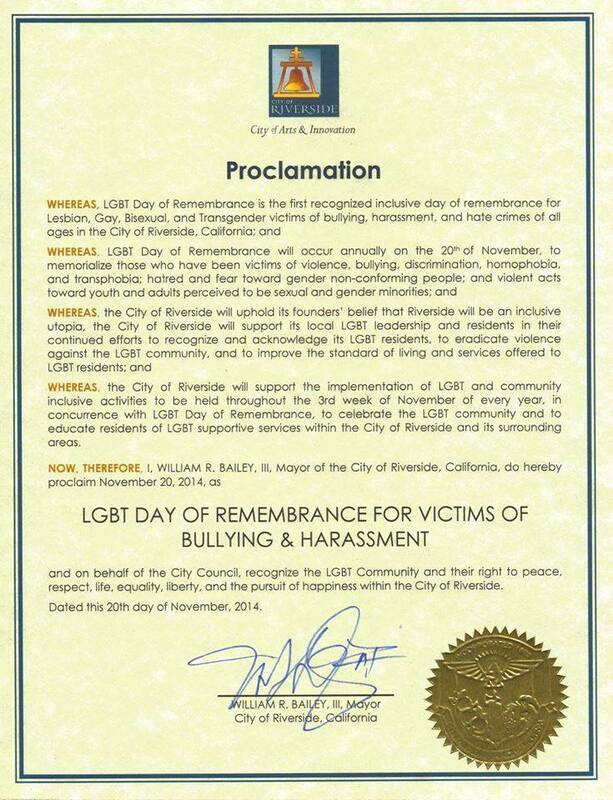 I wonder how many people involved with converting Transgender Day of Remembrance – remembrance of murdered trans people – into LGBT Day of Remembrance for Victims of Bullying and Harassment never lifted a finger or raised a voice against Gay, Inc.’s history of transphobic hiring practices? at least if you’d wasted far too much time watching network cop shows of the 1970s with equally dubious production values. Unfortunately, the title can now be appropriated for a very non-comedic documentary: Murder Can Hurt You Even if You’re Already Dead – If You’re a Trans Woman. Jennifer Gable (her legal name) died suddenly of natural causes – and then her relatives murdered her. Jennifer Gable, an Idaho customer service coordinator for Wells Fargo, died suddenly Oct. 9 on the job at age 32. An aneurysm, according to stunned friends. Just as shocking, they say, when they went to Gable’s funeral in Twin Falls, Idaho, and saw her in an open casket — hair cut short, dressed in a suit and presented as a man. “I am disgusted,” Stacy Dee Hudson posted on Facebook.